Before his retirement, M. Eugene Boring was the I. Wylie and Elizabeth M. Briscoe Professor of New Testament at Brite Divinity School at Texas Christian University, a school affiliated with the Christian Church (Disciples of Christ). I am most familiar with Boring’s work as a translator (especially of Udo Schnelle’s writings), but he is also a prolific author with commentaries on Mark (NTL), 1 Peter (ANTC), Revelation (Interpretation) to his credit. To my knowledge, he has not written any standalone essays or monographs focusing on the PE; however, the PE are introduced and commented upon in The People’s New Testament Commentary (WJK, 2009), written by Boring and his onetime teacher Fred Craddock. 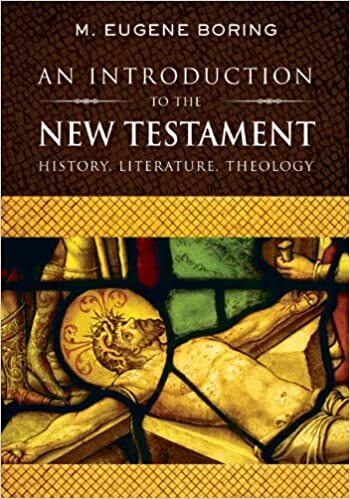 Recently, Boring produced his monumental An Introduction to the New Testament: History, Literature, Theology (WJK, 2012) in which he discusses the PE under the heading “The Pastorals and the Struggle for Paul” (pp. 371-99). In the introduction to the volume, he highlights the influence on his life and thinking of men such as Leander Keck, Craddock, Russell Pregeant, Udo Schnelle, David Balch, and William Baird. My purpose here is simply to summarize Boring’s work on the PE. Boring discusses the issue of authorship at great length, finding it to be “a watershed for the critical approach to the New Testament” (371). If a scholar holds that Paul wrote the PE, he or she will almost certainly hold that all the books attributed to Paul are authentic; conversely, if Paul is not believed to have written one or more of the PE, the door for pseudonymous authorship in the NT is open. For Boring, the question of authorship “should not be resolved on the basis of dogma from right, left, or center” (371). Boring briefly presents the arguments of those who support authenticity: the claim of the letters themselves, their canonical status (the church wouldn’t have accepted pseudonymous writings, and inspiration is incompatible with pseudonymity), church tradition, and the lack of any single compelling argument for pseudonymous authorship of the letters. The letters’ claim to be written by Paul can be dismissed without fear of a historical or theological misstep, since “the question for the ancient church . . . was not the historical issue of who actually composed [documents claiming apostolic authorship], but the theological issue of whether or not they represented the apostolic faith” (372). The consistent acceptance of the Pauline authorship of the PE by the early church fathers is not proof positive of authenticity, because the fathers “were theologians first and historians second.” The PE were accepted by the fathers because they “represented the apostolic faith” and “found resonance within the wider community of faith” and on this basis, their claim to apostolic authorship was accepted (373). “The chronology and personal allusions presupposed by the Pastorals do not fit into the lifetime of Paul as otherwise attested” (373). Certain internal inconsistencies regarding Paul’s historical situation appear to be present in the PE, casting doubt on the letters’ historical accuracy (373-74). The self-portrayal of Paul in the PE seems to be at variance with that in the undisputed Pauline letters (374). “The content and tone of the Pastorals are simply not appropriate” when considering the recipients are veteran coworkers of Paul’s (374-76). Various aspects of the letters connect them with the third generation of Christian leadership, when the succession of Paul’s leadership was being worked out after his death (376). The sort of false teaching that seems to be present seems to reflect a later time than Paul, and the response to it in the letters seems unlike Paul’s response in the undisputed letters (376-77). While the hypothesis of pseudonymous PE written specifically to combat Marcion is problematic, the PE’s insistence on the continuing value of the OT “could point to Marcionite tendencies the Pastor opposes” (377). “Both a different vision of church leadership and a different church structure” (this includes the role of the Spirit) seem to be present in the PE, over against the undisputed Pauline letters (377). The PE seem to portray a church in the process of becoming institutionalized (377-79). “The Pastor’s perspective on women’s role in the church reflects the period after Paul” (379-80). There is a “dual temporal perspective” in the letters; while meaning to represent the time of Paul through various incidental references, the pseudonymous author of the letters portrays Paul as “predicting a later time” as a way of having Paul directly address the concerns of his own post-Pauline audience (380). The PE make allusion to Paul’s undisputed letters which it is assumed the readers will recognize, which suggests the PE were written to supplement an already-existing Pauline collection (380). The PE are clearly meant to be heard by churches, but are written to individuals. On the traditional view, this would mean that Timothy and Titus received and kept them, and some time later they were incorporated into the general life of the church, and eventually became part of the accepted NT canon. Boring finds the pseudepigraphical explanation simpler: they were written (falsely) to individuals but read to churches (380-81). “The Pastorals reflect and interact with later New Testament movements and literature current after Paul’s time,” e.g., the “Johannine stream of tradition” and the hymns in Revelation (381). “The style and vocabulary of the Pastorals point to a post-Pauline setting” (381-84). Boring provides a number of typical examples to support his contention. In sum, “These considerations provide substantial reasons for the view that the Pastorals are post-Paul compositions emanating from the Pauline school” (383). Boring’s tour de force doesn’t end here however; he goes on to provide “incidental support” for this view in the rest of the chapter’s discussion. Boring notes approvingly the critically accepted date of around 100 CE for the PE (his chart “Formation of NT Literature” [p. 6] actually places the PE after 1 Clement and the Didache and roughly parallel with Ignatius), and discusses the various uses (and non-use) of the PE in the NT writings and other early Christian writings, which in his view support this date. Provenance is likely Ephesus. The theology of the PE (pp. 384-89) receives extended attention, particularly in relation to that of the undisputed Paulines. Boring views the theology of the PE as being in continuity with that of Paul, and argues that “the Pastorals do not simply repeat Paul but present him as adapting his theology to the post-Pauline situation” (385); the PE are concerned with “preserving the essential core of Pauline theology and reinterpreting it for a later generation.” So, e.g., Paul’s dynamic “faith” becomes “the faith” in the PE, a static body of orthodox doctrine; angels, about whom Paul “never had a good word,” are spoken of positively; the body of Christ has become the household of God. Paul’s expectation of an imminent parousia is absent in the PE. Boring finds the ethics of the PE to have a “different emphasis and perspective” than those of Paul. Boring provides brief outlines and sets forth the essential argument section-by-section for each of the PE. He closes his treatment by appropriating Margaret MacDonald’s model for situating the PE in early Christian history; they reflect a later “community-protecting institutionalization,” following the “community building” of the undisputed Pauline letters and the “community stabilizing” of Colossians and Ephesians (398). He finds that while the post-Pauline church rejected extreme views such as Gnosticism, they accepted a “limited plurality” of “interpretations” of Paul reflected in various pseudonymous letters. Boring sees 2 Thessalonians as such a letter, reflecting a “centrist” view; Ephesians and Colossians as having been produced by “left wing” interpreters; and the PE as setting forth a “right wing” understanding of Paul (399). In his work, Boring engages a limited range of literature specific to the PE. He refers to Trebilco’s Early Christians in Ephesus a number of times. His “further reading” list is brief, pointing only to four commentaries (no monographs): Bassler (ANTC), Collins (NTL), Johnson (AB), and Marshall (ICC). His take on the PE would be closest, I think, to that of Bassler and Collins. I recently taught through the letter to Titus in three sessions at my home church, First Baptist Church, Jackson, TN. These three messages are an attempt to teach the content of this letter and apply its truths to our current context. The audio of each session is available here.